For growing families that are constantly on the go just like yours there is nothing better than the efficiency and versatility that a minivan provides. The 2019 Dodge Grand Caravan not only delivers everything that you’d expect from a minivan but so much more. It has three trim level options that make it easy for you to find the interior amenities and cabin comforts that you want without blowing your budget. You can learn more about the efficient engine of the 2019 Dodge Grand Caravan along with its standard and optional equipment right here below and you can find the 2019 Grand Caravan at Cowboy Dodge in Clinton, AR right now today. The three trim levels of the 2019 Dodge Grand Caravan include the SE, SE Plus, and SXT. 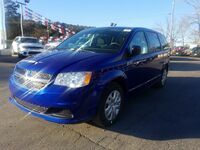 All three of these trim levels get equipped with a 3.6L Pentastar V6 that supplies the 2019 Grand Caravan with 283 horsepower, 260 lb-ft of torque, and a 3,600-pound towing capacity with the available Trailer-Tow Package. This 3.6L engine pairs with an Electronically Controlled 6-Speed Automatic Transmission to achieve EPA fuel economy estimates of 17 MPG in the city and 25 MPG on the highway. The cabin of the 2019 Dodge Grand Caravan has spacious seating for seven people and the Grand Caravan provides them with 158.6 cubic feet of overall passenger space. Both of the rear rows of seating have the ability to be folded flat for awesome cargo and passenger flexibility. The standard cargo area behind the third-row seat measures 31.1 cubic feet and with the rear rows of seating folded flat the 2019 Grand Caravan can handle 140.3 cubic feet of cargo. All trim levels of the 2019 Dodge Grand Caravan also get loaded with a 6.5” Touchscreen Display with a 6-Speaker Stereo, and a 28 GB hard drive for storing all of your favorite music on. The SE Plus and SXT trim levels add Bluetooth® Streaming Audio, Uconnect® Voice Command, and a 1-Year Subscription to SiriusXM® Radio. There is also the option of a High-Definition Multimedia Interface, a Garmin® Navigation System, and a 2nd-Row Entertainment System with a 9” Video Screen and DVD Player for all trim levels of the 2019 Dodge Grand Caravan. 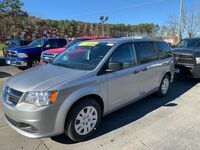 You can take the 2019 Grand Caravan for a test drive today at Cowboy Chrysler Dodge Jeep Ram to help you figure out which trim level is right for you.